And then things start to get REALLY weird. First, her shadow has come to life and started talking. But even more alarming is when she discovers that the school hierarchy consists not only of the usual groups of jerks and wanna-bes, it also includes the Zeroes, who walk around all zombie-like and weird and have to go to a special classroom. What’s going on at this crazy school? And just what does Suee’s shadow have to do with it all? Observations: I really enjoyed how relatable this one is; it takes place in a Korean school, but it feels like it could be any elementary school anywhere in terms of the worries and feelings of the students, and in the types of challenges they face. Suee is quirky, but with depth, and a well-developed sense of snark. I really enjoyed the artwork in this one, too—the blend of humor and spookiness was well done, the characters were easy to follow, and the overall style was appealing. 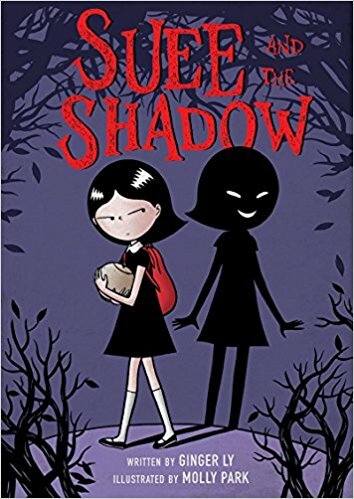 The book does a good job of weaving in common concerns of school and home and family with the suspenseful and supernatural creepiness of the ghost story, with thought-provoking moments that deal with the meaning of friendship, the subtle provocations of classism, and the emotional cost of bullying. I received my copy of this book courtesy of the publisher. You can find SUEE AND THE SHADOW by Ginger Ly and Molly Park at an online e-tailer, or at a real life, independent bookstore near you!